For the past few weeks I have been monopolising one of the small tables in our living room, much to the disgust of my family especially as on some days I spread out onto the sofa too. The monopoly has been caused by some small knitted creations which I was picking up and working on each time I had a few spare minutes. Knitting rows and then occasionally unpicking them as some of the creations had no pattern to work from. "Cat was asleep, Dog was asleep, Cow was asleep"
How I would love to have my own dedicated crafting space, where I could leave my works in progress out and return to them in the knowledge that they will not have been strewn around the place. If I am not monopolising the table then it is the back of a chair in the same room which sometimes has sewing in progress draped over the back of it, it has the perfect back for draping. Once I have gone to the effort of ironing and cutting out material I don't want to fold it up and put it away, I will forget about it then and have to re-iron it, so it sits as a reminder that it needs attention and often gets knocked on the floor. "Sheep was asleep. Pig was asleep, and so were all the Piglets"
Those small creations came about as a result of a conversation I had with my sister in law, some time ago, about presents. She and my brother have four children all born in a four week period, my own daughter has a birthday during that time too, if I am to get presents sorted for them all in time I have to start early! With two older siblings and mum being a childminder it is really hard to know what to give the youngest two (twins) as they have so many things in their house already. Somehow that conversation got onto story sacks. It was all so peaceful - till.... snore! and Cat woke up. Cow woke up. "Sheep woke up. Pig woke up, and so did all the Piglets"
I needed a dog, a cat, a cow, a sheep, a pig, some piglets and a rooster. I thought about sewing them with felt but they needed to be robust and I wasn't sure I could achieve that. My twin nephews will be two next month and, as a childminder, mum wants to use it with her minded children when they have outgrown it. It needed to last, I thought knitting them would make the animals stronger. I had patterns for most of the animals some of which I had made before, the others I had to make up with varying amounts of success. I have whipped up a bag for the animals, to keep them all together, and another bag to store everything in. I have added a second book to this sack, a story written by a local author about bedtime. I hope it gets lots of use! Oh and the rooster? He was my favourite to make, he, naturally, wakes the dog up! That is one of the most thoughtful and gorgeous gifts I have seen......love them all especially the rooster...what a great way to tell a story. Oh my goodness, those animals and the bag are just adorable! What a wonderful gift!! Thank you, I hope my nephews love it! What a gift you have...what a gift you give. I am sure any child who would receive this beautiful and thoughtful gift would cherish this. I do hope it is cherished. Thank you Kim. I cannot claim that I came up with the button idea. I can't remember where I did come across it though. It changed him completely when I added it, it felt finished! Thank you Penny :). I do hope it is well loved. Ah that tidying away mid flow, that is the bit I find frustrating. Oh my goodness - this is amazing! This would be perfect for my little farm animal obsessed little babe. She has started talking about things she'll do "when she is a farmer" and she puts on items of clothing and says that she is a farmer now. Fantastic knitting skills and creativity! They are really easy to knit up, the sewing and stuffing is a little more fiddly but not impossible, give them a go! Thank you :). Your rag rug sounds great, a good way to use up scrap material. These critters are super cool, what a great idea! I have bags with knitting hanging from most door handles in the house.... not even daring to look at the flat surfaces! I have to admit to having had a bit of a sort out now this is finished, I had projects all over the place........ones I had forgotten about too! These have got to be the most DARLING knit toys!! Although I normally hate doing anything with lots of shaping or appliques (I'm lazy), these are going on my list for my 1 year old daughter. She needs more handmade toys and less plastic (that she got for her birthday). Thank you so much for this beautiful post + patterns! What an absolutely fabulous gift, I love it. I've been waiting to see what book your next story sack would contain, the animals are wonderful. I think the pigs are my favourites but then I have a bit of a thing for pigs. I'm sure this will be a much loved and cherished gift. I think they will be excited, my nephews are add that wonderful age when everything is exciting and interesting. Perhaps you could make one for the grandchild you have on the way, when they are a bit older? ~Aww they're all so cute but I just love the Rooster - what a wonderful idea, I'm sure your nephews will love them! I hope they do too after all that work! What beautiful little knitted animals - you are very talented! What a lovely present! I have been wanting to knit farm animals for my children, now I simply must. Thank you for the inspiration. And that table situation? Yeah, I hear that! How lovely, especially those little piglets. Thank you, the piglets were fun to make! i swear i have come here and commented on this great bunch of crafting... it all looks so great. love the chicken! Gorgeous, I love your story bags. They will be well loved. I do hope so Lucy, as they were a requested present I am sure they will! Oh! I love everything! 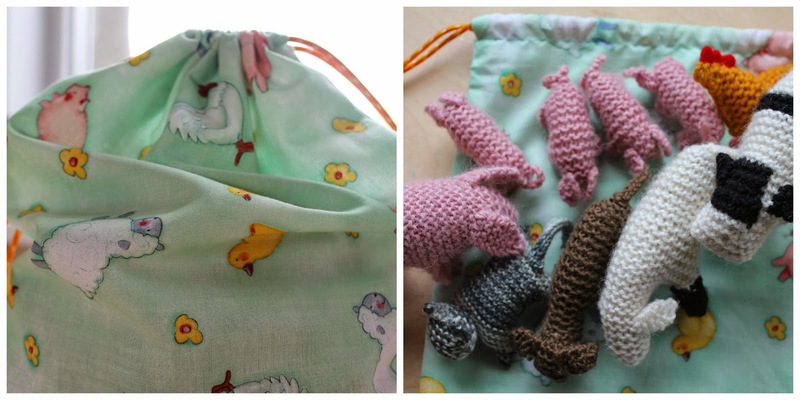 The animals, the bags… Adorable! Thank you Sarah, I would have a hard time choosing my absolute favourite too! ...is a blog about treading lightly and enjoying it, if we can make it, we do, but we don't make do. Nature, the seasons and being outside is at the core of our lives, home education is thrown in the mix too. You can read more about me here. Thank you for stopping by. © All content to present sustainable mum . Simple theme. Powered by Blogger.